Lake Almanor is located 165 miles north of Sacramento, nestled amongst the pines where the Cascade Mountains meet the Sierra Nevadas. At elevation 4500 feet it is the third largest manmade lake in California and best known for its prime hunting and fishing grounds. There are two golf courses on the lake, Bailey Creek in the peninsula & a nine hole at Lake Almanor West. OK, we're fishermen, not golfers! Mount Lassen National Park is just 26 miles away, has hiking (to the top! ), picnicking, and very scenic views. Play tennis in the peninsula or bike around the lake (many other trails for cycling to choose from). This cozy home is situated on the east shore of Hwy 147. 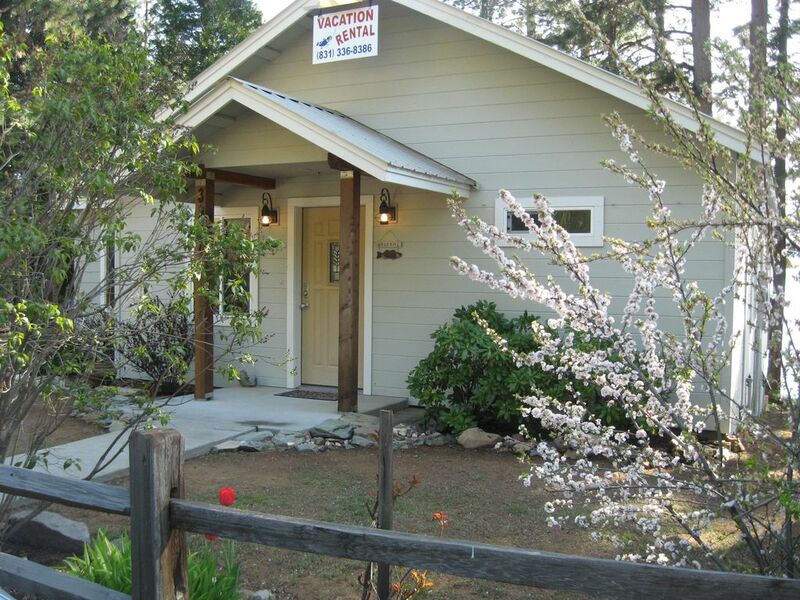 Just about the middle of the 8 mile strip at 3907 Hwy 147, Lake Almanor, CA 96137. Enjoy sunsets on the deck or fish right off the dock. Bring your boat, there's plenty of excellent fishing holes around. During the summer months we rent Friday to Friday. Truly is a nice spot on the lake. Shopping and antiquing can be found in all the quaint old fashioned towns around the area. Dine out in Chester, the peninsula, try Westwood's famous Buffalo Chips Pizzeria ("Cabin Fever" is our favorite). Rent 6 nights during October through mid-May & the 7th night is free! For a truly affordable vacation on the lake this is the place. We purchased the home in 1999 as strictly a business investment. Little did we realize how in love with the entire area we'd be. John loves to fish & sure gets his limit! We live in the bay area but travel north to the home monthly. It's our favorite place to go! The history of the Lake Almanor Basin is fascinating (we keep a book on the shelf to share with our guests). We found out the home was built in 1953 by Finnis Mack Saunders, nicknamed 'Chief', a foreman for the Red River Lumber Company. The knotty pine walls & ceiling in the kitchen are priceless! We've respectfully done some remodelling while keeping the old world charm of the home. Uncle Johnnie's Fishing Cabin is situated on the middle of the east shore & is truly a nice spot on the lake. We enjoy sharing the home as much as our guests enjoy vacationing there! Please bring personal beach towels. 4 slices at a time! Cupboards full of cooking supplies & spices. Paper supplies provided: coffee filters, paper plates, paper napkins, roll of paper towels, 3 rolls septic safe toilet paper in each bathroom. About 30 dvd's to choose from. Lovely cabin with a view! We stayed in the cabin and it is very cozy, the bed was very comfortable and it is equiped with everything you need for your stay, the view of the lake is gorgeous!! Well located, we felt like home. We will go back for summer if available, we want to be able to go on a kayak and visit lassen park, during our stay it was raining and we were not able to be outdoors as much as we would like, but we had the opportunity to walk in one of the trails and breath the wonderful clean air and enjoy the forest and of course family. This was our second time at this very special Lake Almanor cabin. Well equipped and appointed. Excellent location. Wonderful lake view. Spectacular sunsets. Comfortable beds. A real "home away". We thoroughly enjoyed our most recent stay and will come again. From the moment we walked in the door, Uncle Jonnie's Cabin felt like home. It's so cozy, with everything you need to have a fun, relaxing time during your stay. The view from the deck is breathtaking, and the sunsets are spectacular! Unfortunately, it was very windy every day we were there, from around 11:30am or 1:30pm, until late afternoon, so we were only able to go boating one day. We were never able to tie up the boat and leave it at the home's dock as we had planned, as the wind would whip the dock around way too much in the afternoon. If we were morning people, we could have had more time on the water, as it was really nice up until then. The boat launch at Canyon dam was never busy when we were there, and it's less than 10 minutes away. There is a rather loud train that goes by several times a day and/or night, but you don't really hear it too much if you're inside with the windows closed, and it never really woke us up. The decor inside the home is very well thought out, and matches the fishing theme name of the cabin. The binder gives a wonderful, detailed history of the property, as well as lots of other useful information about the area. The home is actually centrally located, and nothing you need is more than about 15 minutes away. We had a great time relaxing and spending time with our kids while we were there. The owners were very nice and accommodating as well. We'd definitely recommend Uncle Jonnie's! Comfortable two bedroom cabin with nice shaded views of the lake. Clean and modern bathrooms in each bedroom with a spacious shared closet. The convenient dock allowed boat pickup practically to your door. The fishing was best in the morning as the nice breeze in the afternoon keeps the heat down. The country club on the peninsula provided a delicious relaxed restaurant after a day on the water. Very accommodating homeowners are easy to contact and very helpful. We will definitely be returning. This place was awesome. It was super clean, it was very comfortable and everything you needed was there. Made our vacation super relaxing!! Thank you Deborah!! We allow indoor pets, please read pet policy. Pets must stay away from the beds & sleep in there own bedding as the home is shared by guests that do not have pets. We charge $50 per pet that will be staying.